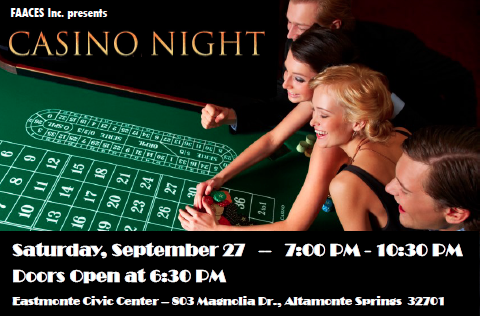 On September 27th 2014, FAACES Inc. will host a Casino Night FUNdraiser to benefit our new Fresh Start project. Please come and bring your poker face and have a blast! The event features a DJ and a great raffle prizes including a vacation, restaurants, a casino party and more. Your ticket includes a light buffet, chips, and raffle tickets. Additional tickets are available during the night. Space is limited so get your tickets now ($40.00). Click the Buy Now Button Below. Our you can reserve your spot by e-mailing diana@orlando.bz and picking up your tickets at the door ($50.00). You can also buy a block of 4 tickets for $150. Liquor will be served, so 21 and up only please. For more information, contact Diana by phone at 407.466.1993 or via email at diana@orlando.bz. FAACES is a 501(3)(c) corporation. All contributions are tax-deductible.